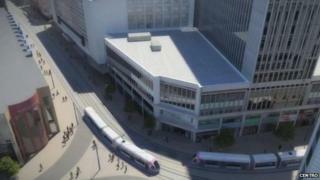 The first rails have been laid on a £127m project that will see trams return to Birmingham city centre. The Metro currently links Birmingham with Wolverhampton. A 1.2km (0.7 mile) scheme, due to be completed in 2015, will see the line extended from Snow Hill railway station to New Street station. The route, along Bull Street, Corporation Street and Stephenson Street, will see trams in the city centre for the first time since 1953. The extension is being part-funded by £75.4m from the Department for Transport, which gave its backing in February 2012. Work began in July although the first rails have just been laid. Centro, the West Midlands transport authority, said the Metro extension would "revolutionise the way people travel to and around the city" and carry up to 3.5 million passengers a year. But Baljit Kandola, co-owner of Bull Street-based newsagents Central News Midland, said his trade had fallen by 60% since the start of work and said he has had to sack three employees because of that. "When the buses stopped that was bad enough but ever since the tram extension began, it has become a lot worse," he said. "Hopefully we will benefit when the Metro is up and running but that's two years down the line. I'm not sure we'll still be here." Meanwhile, Aggie Pelekanou, owner of Monty's Deli Sandwich Bar, also in Bull Street, said his breakfast trade had halved since the start of the tram scheme. "It started when they moved the buses in August last year," he said. "People used to get off the bus, grab a coffee. Now there is no passing trade at all. The workers have been good. They have arranged their shifts so they're not using the loud machinery when we're doing our lunch service but I can't lie. It has been hard." The tram extension is expected to create more than 1,300 new jobs and boost the West Midlands economy by more than £50m a year. Four tram stops will be included as part of the scheme: at Snow Hill, Bull Street, Corporation Street and Stephenson Street. Roger Horton, Centro's lead member for rail, who laid the first rail track at Colmore Gate in Bull Street, said traders had been compensated for their losses. "Once there are trams coming past their shops, the traders will benefit," Mr Horton, who is also a Sandwell councillor, said. Birmingham councillor Kath Hartley, the vice-chairman of the West Midlands Integrated Transport Authority said she also thought it would be "absolutely worth it". "It may not be that far a distance in this first phase but this is only the first step," she said. "Eventually this will go out to all the main centres. Quinton, towards the Black Country and the airport via Bordesley. It is what the people want." But some people passing Corporation Street said they were unaware of what work was going on there. "It's roadworks I think," said telecom salesman Bradley Davis, a 19-year-old sales assistant, from Metchley Lane in Harborne. "It's been like this for about a year. I think they are making the road bigger."